There’s so much to this case so I’m going to try to break it down so that people will understand why this trial was so unfair and why so many of us are trying to inform others about what occurred during the investigation and trial. I’ll start with the Google search because it was the only evidence that held any weight in this trial and we now know that the guilty verdict was based on this “evidence”. There are so many problems with this evidence that it shouldn’t have been allowed in the courtroom to begin with. The prosecution alleged that Google Map search files were found on Brad’s Cisco laptop (IBM Thinkpad). The files indicate that the zip code was entered, followed by a bee-line to the Fielding Drive area (where the body was found) and then several consecutive zoom-ins in that exact location. The search lasted a total of 42 seconds. This included time for each map to load. The final map image lasted 2 seconds, then the browser was closed. The alleged search took place on July 11th ’08, one day before Nancy disappeared while jogging. Several months before the trial, Judge Gessner denied the defense attorney’s request for the FBI procedures and MFT (Master File Table) from the computer. The prosecutors claimed that it could jeopardize national security and the judge went along with it. Judge denies request for FBI procedures. Why did they hide behind “national security”? The police could have gone to the SBI to have the forensic exams performed on the computer. Or they could have gone to a digital forensic specialist, but they specifically chose the FBI to perform the exam because they knew they could hide behind national security. Does this case set a precedent? I’m not aware of any other cases that exist where discovery rules can be ignored based on national security concerns. I will write more about the trial proceedings regarding the Google search, specifics about how the computer was handled by the police, and evidence of tampering and spoliation that was found by two defense expert witnesses in the next few days. I would like to know that too, MiMi because it was never proven. It could have been, had they subpoenaed the cookie data but of course they didn’t. It still amazes me he was convicted on this. because they got paid to convict him. that would be the jury. i really do believe deep down that someone paid them off to convict him. that would be the ONLY thing that the jury could use. they had NOTHING else to use. I don’t know how the Prosecutors, the Judge and members of the Cary Police Dept move on with their lives after this. They know they did not conduct a thorough investigation, Chief Bazemore even admits “mistakes were made”, yet she never showed her face in the courtroom to support her group of detectives. They did NOT want to follow any exculpatory evidence, they were NOT interested in proving someone else committed the murder. They deliberately avoided suggestions made by the CCBI/SBI. They deliberately erased the victims cell phone and conveniently waited to tell Defense until it was too late to get the records. They did not PROVE the Google Map search was done by Brad Cooper either, who would search a dump site on a computer. No one would search Cisco’s network to prove the actual search was done at that time at Cisco. Why did the Cary Police Dept not conduct a thorough investigation, cause the truth would point away from Brad Cooper. They needed to frame him to save face, to protect their own, and keep that safe community image for the Town of Cary. None of the them to this day can tell us how, when, where an alleged struggle took place in the house. 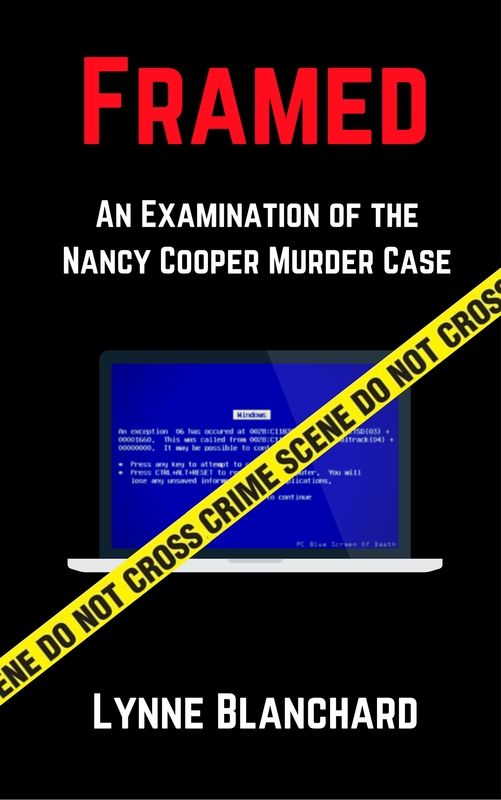 The 3′ 11″ interior wheelbase measurements of the tracks found leading to/from Nancy Coopers body did not match either of the Cooper’s BMWs. Det Daniels testified he didn’t know which car was used to dump poor Nancy Cooper. Even with the alleged map search, it was no proof that Brad Cooper murdered his wife, they never proved HE did the search. The footprints around her head, the obvious tire tracks leading to/from her, the proof that he did not spoof the 6:40 am call and 16 witnesses reporting seeing someone of her description that morning screams reasonable doubt. Have you not read all the evidence of tampering that is now easily accessible since the trial? To begin, none of the computer “evidence” should have been admissible because the computer wasn’t properly handled by police. What are the odds that this incriminating piece of evidence would have so many odd things associated with it? And we’re supposed to somehow buy that it is a valid search? I don’t think so. Besides invalid timestamps, the cursor file extensions should have been .cur for Google, the MACE values are all the same in a dynamic search (impossible if the search is valid), the password on his laptop was changed, the admin password was changed, files (including TIF files) were changed while in police custody. There was NO cookie associated with the search. We’re supposed to believe that Brad automated a call leaving no trace and nobody has a valid explanation as to how it was done since NO records indicate it, yet he was careless enough to leave temporary internet files on a search of Fielding Drive? And we’re to believe he selected a body dump site in 42 seconds on a map that was a year old? You are wasting your time discussing the “alleged” Google search but I guess that is the only thing there is to talk about since there is not one shred of evidence (besides this fabricated evidence) that he is guilty. BUT, isn’t that the job of an investigator to find out? They were fresh tracks, yes? They measured them, yes? They thought they were important enough to look at, then they dropped the ball. That is part of the problem. When you don’t follow through with every single piece of evidence there is always problems you will face. It was very clear from the first phone call in this case that the finger was pointed at Brad Cooper. Ahhh…didn’t realize anonymous was also a wheel base expert! Check your facts – your wrong! Many vehicles will provide an approx 4′ inside wheel to inside wheel measurement. You clearly have not seen the photographs of the crime scene where Nancy Cooper was found. These photographs taken around midnight do not show any light structures in place near the tiretracks. Nor have you viewed the CCBI hand drawn diagram illustrating the tire tracks. CCBI Christopher Hill testified they measured the INTERIOR wheelbase of the most prominent tracks leading from Nancy Coopers body. These measurements were compared to the Coopers BMWs and neither were a match. My mid size SUVs interior wheelbase is approximately 3′ 8″. Try finding a place to dump your own body in 42 seconds and let us know how you did. @Anonymous-How do you explain the missing ‘cookie’? There is no explanation for that…if Brad had done the Google search, the Google cookie WOULD have been on his computer. And IF Brad did the search, but deleted the cookie, he certainly wouldn’t have been stupid enough to leave everything else. Seriously–think about what you are saying. Anonymous your points don’t actually support Brad doing the search at all. 1. As you said Brad left for lunch with with his co-workers at 1:14, the Google search was supposedly done at 1:15. 2. The 27518 zip code is pretty irrelevant since Fielding drive is not now nor was it ever in the 27518 zip code. 3. It doesn’t make any sense for Brad to have logged in shortly before the search was done because as you mention in your point 4.: Brad accessed personal data prior to the search which means he would have already been logged into windows. Thanks for helping to prove that it makes no sense to believe that Brad did that search. 1) My computer and I are together right now – but I’m not doing a google search. 2) The area the body was dumped is not and was not in the 27518 zip code. 3) Window system event log shows me logging in and I can assure you, I have not done a google search. Actually, it is probably more accurate to say it shows that someone logged in with a particular userid/pw – maybe it was me or maybe it was someone else. 4) I have accessed data, both personal and professional and again, I have performed no google search. Not exactly sure what your points are suppose to prove. To Anonymous I have always felt there was some sort of payoff made maybe not in money but I feel that something happened at the hockey game that Andy Gilbet (jury spokesperson) and the Rentz’s attented on the same night but no one checked into it I feel that some sort of jury misconduct was made.